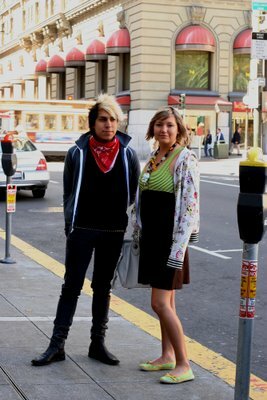 Luis: "LA's kind of punk, when I used to dress punk and more designer clothing like Marc Jacobs." Erika: "My mom, she dresses crazy and I love Heatherette's crazy fashion. I wake up and I just decide to dress cute everyday." I like how they are having fun with their clothes. 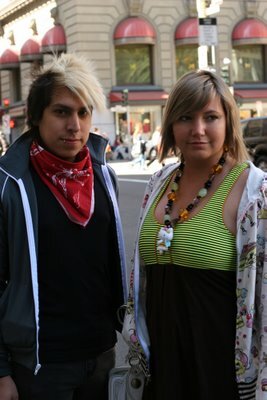 Notice Luis' MJ neck scarf and Erika's cute babydoll worn with a necklace of her own design. Erika is also the phenom behind Alter Ego Jewelry.